(CBS News) Let me start this post off by saying that under no circumstances should anyone ever try to emulate the good deed done in this video. Got it? Good. 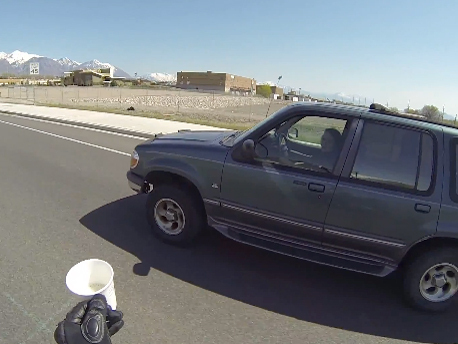 Alright, with that out of the way, now you can watch from a first-person perspective in the clip above as a motorcyclist is able to deftly maneuver and save a cup left on the back fender of a Ford Explorer. It's a total trip. Indeed, I just hope this isn't his everyday good deed... Either way, we at The Feed would like to honor him with a big triple-rainbow salute of excellent karma! And to check out more motorcycle moves on display from Bossaucey, be sure to visit his YouTube page by clicking here.